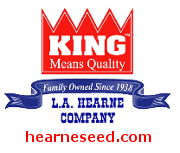 Hearneseed.com is a division of the L.A. Hearne Company located in Monterey County, California. L.A. Hearne Company was established by Larry Hearne in 1938 and is still owned and managed by the same family. We pride ourselves on providing top quality products and customer service. You can count on us being here to serve your needs as we have been for 68 years. We are proud to feature the best in quality field seed, cover crop seed, erosion control seeds, grains, wildflower seed, pasture mixes and a variety of other quality seeds. We can supply you with your seed needs either as single varieties or customized mixes optimized for your conditions. We stock a large inventory of many varieties of the listed categories to fill your exact needs. You can order securely right here on our site or contact us here if you need further information.